I adore Soap and Glory bath and body products so when Boots had a 3 for 2 deal on their cosmetics range I decided why not purchase some things I've been wanting to try. After hearing so much about how great the Solar Bronzer was I knew I definitely wanted to pick it up to give it a try and along with it I picked up the Glow All Out highlighter and One Heck Of A Blot powder. 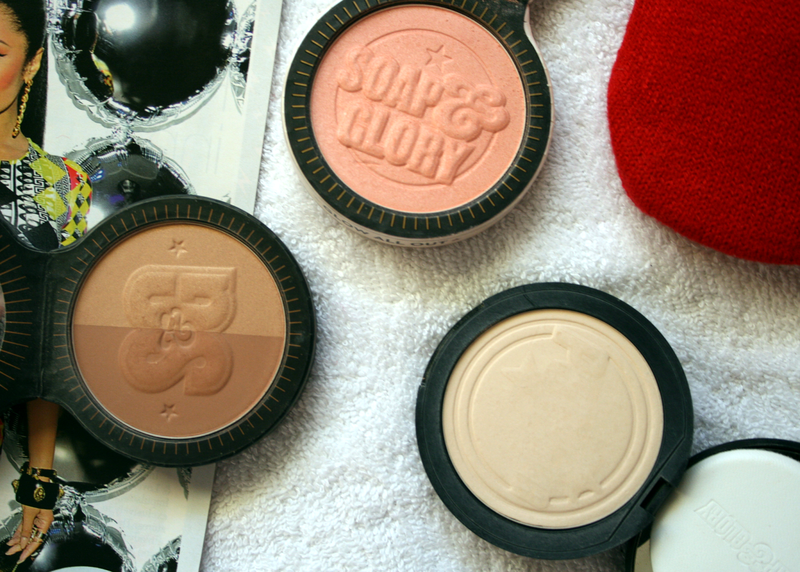 Solar Powder: This bronzer is definitely great because it's light in colour and buildable. When you first get it the S&G have pink shimmer on them but after one or two swipes it's gone and it doesn't transfer onto your skin so you don't have to worry about that. This is also a matte bronzer so you could use it to contour. Definitely gives you that gorgeous sun kissed glow! Glow All Out: I wasn't a big fan of highlighters until recently and so decided to try this one out because the colour was so pretty. Let me just start off by saying this colour is absolutely stunning on! It really gives you an unbelievable glow and just makes your skin look so healthy. I've been constantly using this since getting it and right now it's definitely my favourite highlighter out of the ones I own. Definitely recommend you go to your nearest Boots store and give this a swatch as it is so beautiful. It does have glitter in it but not big chunks of it more like little shine spectacles to give you a nice healthy look. One Heck Of A Blot: As you can see from the photo I've been using this alot so the pretty like design featuring the word 'powder' and stars around it have worn off. I really like this powder it definitely keeps my face shine free for hours! Honestly I never even have to top it up, I apply it over my makeup once and by the end of the day my face has no sign of any shine which is amazing. It also helps my foundation stay on longer helping it not disappear from my face which is incredible. I'm one of those people who don't really like carrying alot or any makeup products with me when I'm out and because this does such a great job, I don't have to carry it around with me because I know it will keep my face shine free all day! Overall I'm really impressed with the Soap and Glory cosmetics even though I knew I would be because I adore their bath, body and skincare range. I cannot wait to try some more of their cosmetics and I definitely already have my eye on some products! I haven't tried any Soap and Glory makeup but I've heard a lot about the Solar Powder so I may have to give it a whirl! One Heck of a Blot is my go to powder, use it everyday, I actually hit the pan on it recently, which never happens!